Thousands of food lovers are expected at Halifax’s eighth annual food and drink festival today (Sunday). A variety of stalls will be serving up tantalising treats from local, national and international producers. Just Jenny’s ice cream and Yorkshire Drizzle oils are two of almost 100 stalls who will be selling their produce along Corn Market and Russell Street. And some of the country’s top chefs will be giving live cooking demonstrations on stage. The annual Halifax Food and Drink Festival runs from 10am to 4pm. 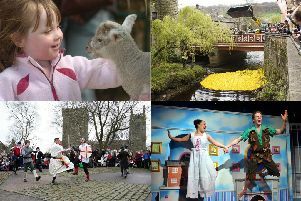 Tweet your pictures to @HXCourier or email newsdesk@halifaxcourier.co.uk.